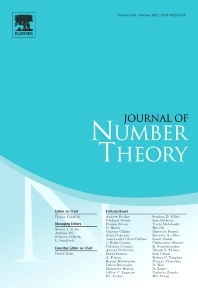 The Journal of Number Theory (JNT) features selected research articles that represent the broad spectrum of interest in contemporary number theory and allied areas. A valuable resource for mathematicians, the journal provides an international forum for the publication of original research in this field. The Journal of Number Theory is encouraging submissions of quality, long articles where most or all of the technical details are included. The journal now considers and welcomes also papers in Computational Number Theory. JNT Prime targets (possibly very long with complete proofs) high impact papers. Articles published in this section will be granted 1 year promotional open access. JNT General Section is for shorter papers. We particularly encourage submission from junior researchers. Every attempt will be made to expedite the review process for such submissions. Computational JNT . This section aims to provide a forum to disseminate contributions which make significant use of computer calculations to derive novel number theoretic results. There will be an online repository where supplementary codes and data can be stored. Currently, the JNT has a large volume of submissions claiming to prove famous conjectures such as Fermat's Last Theorem, the Riemann Hypothesis, the Goldbach Problem, etc. The new JNT does not automatically referee such papers. For papers 20 pages or less JNT charges &dollar;200 a page or &dollar;2000 (whichever amount is smaller) to hire a referee, and for papers 20 pages or more JNT charges &dollar;100 per page. If no mistakes are found, the money will be refunded and the article published in JNT.